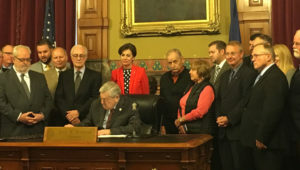 Governor Terry Branstad signs the project labor agreement bill into law. A new state law will prevent state and local governments from striking “project labor agreements” with union workers on construction projects. Supporters of these agreements say they ensure workers are paid a fair wage and the construction is completed on time and within the budget. Opponents, like Governor Terry Branstad, say non-union contractors lose out on big projects that are financed with government dollars. 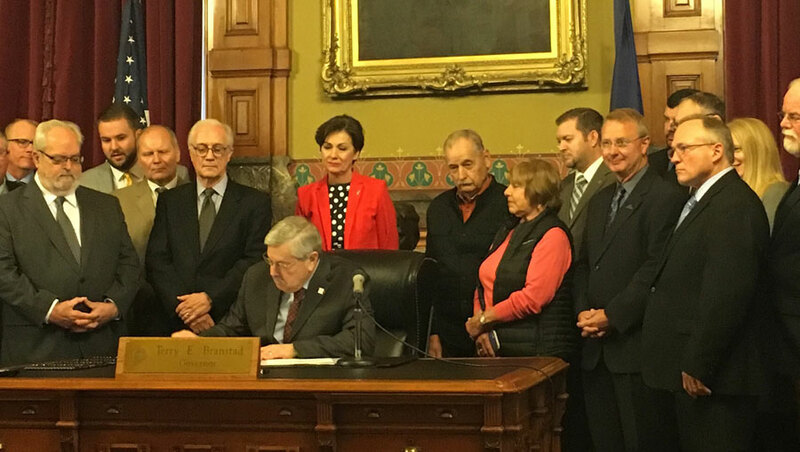 “Publicly-funded construction projects create jobs for workers here in Iowa and it’s important to make sure that all qualified workers have the opportunity to bid on these projects,” Branstad said during a bill-signing ceremony in his statehouse office. Project labor agreements have been used on some of the state’s biggest government construction projects, like the Iowa Events Center in downtown Des Moines. But in 2011 when Branstad returned as Iowa’s governor, he issued an executive order that banned project labor agreements on state-financed construction. The bill Branstad signed into law this week ensures the ban applies not only to projects that are financed with state tax dollars, but construction paid for with tax dollars collected by cities, counties and school districts. A host of organizations that represent businesses and contractors lobbied for this new law. Unions opposed it, as did the Iowa State Association of Counties and the Iowa League of Cities. Democrats say the new law is part of the GOP’s anti-union agenda. Republicans say 85 percent of the construction workers in Iowa do not belong to a union and this new law will help their employers secure government contracts.